Most people begin to notice signs of aging as the skin loses some of its elasticity around our mid-20s. There are several factors that can affect the severity, but in most cases, it is just a normal part of the natural aging process. Board-certified plastic surgeon Dr. Kevin Sadati offers an exciting, minimally invasive treatment that helps to stimulate the production of collagen, elastin, and hyaluronic acid, producing beautiful outcomes and treating decreased skin elasticity. Using a radiofrequency (RF) microneedling, Profound RF technology invigorates the skin, providing the patient with a younger, more youthful appearance. A great option for reducing cellulite, Profound also diminishes sagging jowls, loose skin, and a double chin. Because it does not require surgery, injectables, or significant downtime, Profound is a great option for many individuals who desire a more youthful appearance. During a consultation at Dr. Sadati's private practice in Newport Beach, CA, discover the many ways Profound can help you achieve your aesthetic goals. "Best non-surgical facelift in Newport Beach - I have been interested in having a facelift but due to financial reasons and a heart medical condition that prevents me from having surgery, I decided not to move forward. I’ve been searching for non-surgical options to tighten the face and received an email from Dr. Sadati talking about this new treatment they brought in that only needs one session to see results, not multiple. When I went i..."
Using a specialized handheld device with small needles at the end, Profound is rolled carefully across the treatment area, puncturing the skin and causing micro-injuries to stimulate the production of collagen. Simultaneously, radiofrequency energy is delivered in brief bursts through the needles, warming the skin beneath the surface and further benefiting the complexion. New skin will grow as the micro-injuries heal, leaving the treated area looking and feeling brighter, healthier, and more radiant. The radiofrequency energy is heated to a precise temperature to provide warm relief and is closely monitored for optimal comfort. Your Profound RF treatment will be performed within Dr. Sadati's facility, using a numbing solution to minimize any discomfort. During the procedure, the Profound device will be guided over the desired treatment areas for a predetermined amount of time. You should prepare for very small scabs to become noticeable 24 – 72 hours after your session. These wounds will heal quickly and naturally as collagen growth and new skin is stimulated during your procedure. Optimal results are often realized after the very first treatment with patients reporting gorgeous results in as little as a month post-treatment. Many patients only require one treatment. What does the Profound procedure feel like? Because our practice applies a numbing cream or local anesthetic before initiating the procedure, patients feel very little, if any, discomfort. In addition, the procedure itself is quite fast so any discomfort you do feel will subside very quickly. The delivery of radiofrequency energy will not cause any discomfort as the temperature is precisely controlled and closely monitored throughout your treatment session. What is so outstanding about Profound is that most patients need only one treatment. There is no need to schedule multiple sessions over an extended period of time. Many of our patients achieve the results they desire after their first session. Speak with Dr. Sadati to determine the exact number of sessions he recommends for optimal results. But be encouraged that it will be far fewer than other comparable nonsurgical procedures. Only Dr. Sadati can determine if Profound is the right treatment to help you achieve your goals. 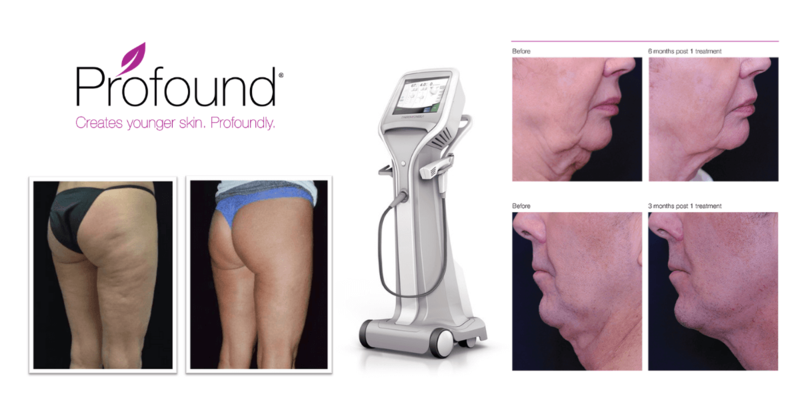 However, those who obtain the best results from Profound are patients bothered by wrinkles, aging skin, and cellulite. The radiofrequency energy used is combined with the microneedling techniques to reach deep below the skin's surface level, stimulating collagen production and firming skin nonsurgically. Can Profound be used anywhere on my body? While some doctors use Profound primarily on the face, our facility offers full body treatments. In fact, Profound can be used to treat skin laxity, cellulite, and wrinkles just about anywhere on your body. Dr. Sadati commonly recommends Profound to tighten up bat wings, the inner thighs, outer knees, and buttocks without surgery or downtime. While we recommend you avoid vigorous exercise for about five days, most patients feel well enough to return to their normal activities the day following treatment. You may experience redness, swelling, and bruising due to the intentional creation of micro-injuries in the treatment area. However, the wounds will heal quickly, leaving behind firmer, beautiful, and more radiant skin. If you're affected by aging or sun-damaged skin that is not as youthful or firm as it once was, you may benefit from Profound RF at Dr. Kevin Sadati's private practice in Newport Beach, CA. This innovative, minimally invasive procedure is an exciting option with proven outcomes, treating a variety of common complaints. By combining radiofrequency microneedling and skin tightening, this exceptional skin repair procedure has grown in popularity and is rapidly becoming a highly sought-after procedure. Schedule your consultation to learn more.